« A Sign of the Apocalypse? The French and Italians Are More Fiscally Conservative than Americans! 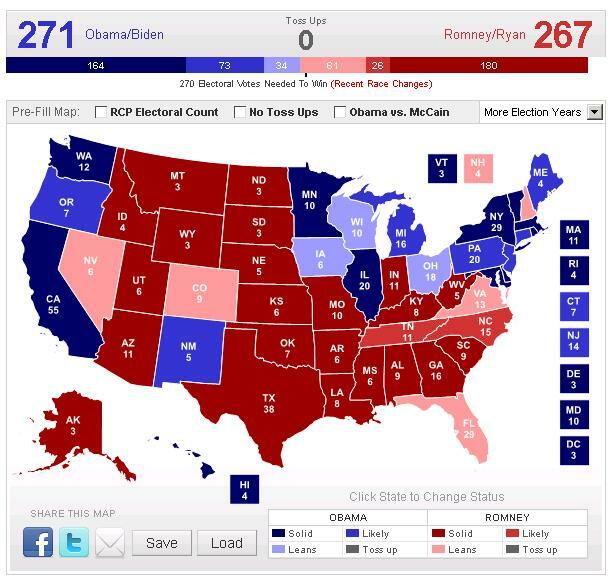 Switch New Hampshire to Obama and Iowa to Romney, and see what happens. There is an increasingly real chance that happens and very little has been written about it. Michigan just got within 3 points after being a 10 point lead for Obama last month. If Democrat turn-out is lower than expected and GOP/Independent turn-out is higher, that could flip Michigan into the Romney column. With the next debate being on foreign policy, I expect Obama to lose that debate big time. The media has sheltered Obama on his foreign policy failures recently and I expect Romney to expose those errors. Hopefully, Romney can lay out his own foreign policy strategy that doesn’t include nation building and wasting more money on cesspool countries around the world! Polls are relevant, but if you are Bayesian you should combine them with prior expectations. Who do you think is closer in worldview to the median American voter, Romney or Obama? that will determine your prior expectations. When the election is over, you might want to revise your prior expectations. If anything, I am expecting a bit of a replay of the chaos of 2000 in the election this time around. Yes, it will probably be close. I fully expect there to be a fairly extreme amount of chaos with the dreaded provisional ballots which will make any election night count useless unless it is an overwhelming victory for either side. Provisional ballots have to marinate for a set amount of time so that bona fides can be checked and a set amount of time must pass for absentee ballots to arrive. Most of this early voting counts as if they were absentee ballots and does not factor in to the election night totals. If the rather unofficial counts from election night show the results hanging on a razor’s edge, we could be waiting for official canvassing to be done which may take until Thanksgiving or longer. In the end, it truly isn’t over until President of the Senate Joe Biden presides over the official count in January 2013. That still is quite a ways away. If anything, I am expecting a bit of a replay of the chaos of 2000 in the election this time around. Yes, it will probably be close. I fully expect there to be a fairly extreme amount of chaos with the dreaded provisional ballots which will make any election night count useless /unless/ it is an overwhelming victory for either side. Provisional ballots have to marinate for a set amount of time so that /bona fides/ can be checked and a set amount of time must pass for absentee ballots to arrive. Most of this early voting counts as if they were absentee ballots and does not factor in to the election night totals. If the rather *unofficial* counts from election night show the results hanging on a razor’s edge, we could be waiting for official canvassing to be done which may take until Thanksgiving or longer. I think Iowa is going to surprise you… and perhaps Wisconsin, too. This election is shaping up to be another 1980. The pollsters were dead wrong then, too. Colorado went romney in latest poll, so that tips it to romney. assuming everything else you predicted is right. Lets not forget this bump is a bump for romney we all know bumps usually don’t hold long term. This thing is going to come down to the second debate, if Romney dominates again this thing is over. If Obama comes back strong it will swing back to him. After the Biden/Ryan debate it will be a landslide. Dan, I hope your predictions are as good as most economists. Not that I’m a Romney man, (I’m not) ,but an Obama win means that the country has slipped over the side of the boat and into the cold water from which there is no return. You are really predicting the end of American exceptionalism, and freedom along with it. So it’s not bad news you are bringing, it’s hopefully just bad predicting.